"Alex, there is an emergency in New Fangak. Stab wound in the back." “How much is it?” I'm asking the salesman. Ahmad, a pharmacist from Cairo, swiftly translates my question into Arabic. The answer is 2,500 South Sudanese Pounds (around $22 USD). We bargain it down to 2,300 ($20 USD). I'm satisfied. It’s a beautiful silk-like fabric that I’m thinking of giving my girlfriend. We sit back down at the table. The sweet ginger tea has already been served. Luckily they serve us in the shade, which is a bit cooling in this heat of 40 degrees Celsius. I'm with Ahmad, my MSF colleague, and Leonel, a carpenter and entrepreneur who's based in Paris. My French classes come into use, even in South Sudan. - "Alex, Alex for Florence!" - "Yes Florence, I'm listening." - "Alex, there is an emergency in New Fangak. Stab wound in the back. You have to go there and bring him with you to Old Fangak." In New Fangak, there are no facilities for conducting surgery. There is only a small clinic which is open daily and where the team can stabilise a patient if it's something urgent. The patient, a young man, was stabbed in his back with a spear yesterday. He's in severe pain but his condition is stable, for now." We pay, leave the rest of the tea and hurry back to base. Five minutes later I'm in a boat. It's me, Rigo, a nurse from Chad, and Mike, our project coordinator from England. The boat is relatively fast at 20-25 knots and normally the journey takes two hours. But another boat has already left New Fangak, bringing the patient to meet up with us. We're planning a so-called “kiss movement” where we meet halfway, transfer the patient and then return. It is a very hot day, but the winds cool us a little. Since I was young the ocean has always made me feel free, and despite the urgency, a part of me is able to enjoy the view along the river. A bit further north the river runs into the White Nile. We're going downriver and along both banks numerous birds are flying. There are so many different species that I lose count. 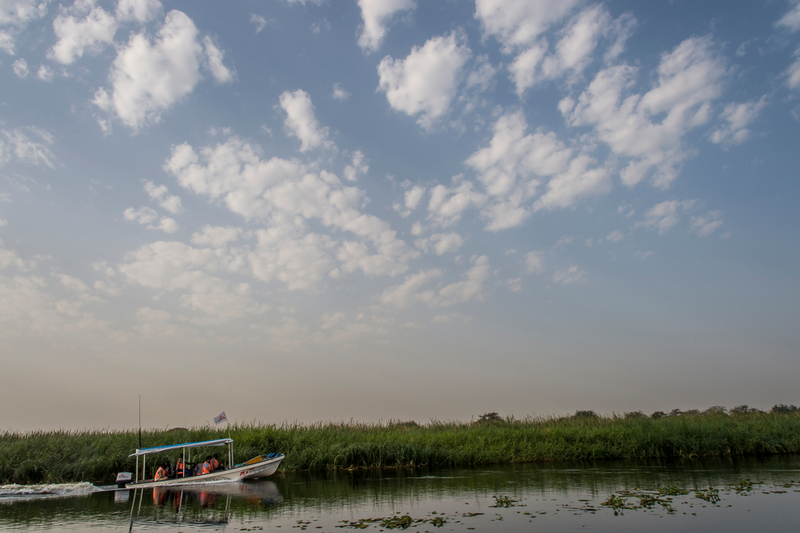 Time goes by quickly as we also see crocodiles, snakes and several fishermen in their canoes. Suddenly an hour has gone by and we can see the boat we’re meeting ahead of us. The patient, a young man, was stabbed in his back with a spear yesterday. He's in severe pain but his condition is stable, for now. He lies on a stretcher which we move over from one boat to the other. Intravenous fluids and painkillers are injected and one hour later we're back at our hospital in Old Fangak. In our emergency room, we use our ultrasound machine. We can see blood in the top right corner of the young man’s abdomen. More specifically, around his liver. Although we can see blood, the patient's condition is still stable, as are his haemoglobin values. Most likely the spear has damaged his liver, but then there are no signs of continued bleeding. I suggest to the team that we observe the patient and our surgeon agrees. Hopefully, we won’t have to operate, at least not right now. On the second day, the young man's condition is stable. The blood around his liver has decreased and the treatment we've been giving him can continue. Hopefully, he can be discharged after just a few more days.